How would you like to have a custom embroidered baby blanket made specially for your little bundle of joy? Almost no parent would turn down such an opportunity, mostly because we all know just how extremely important it is for babies (and their parent’s sanity!) to have a security blanket. When that security blanket happens to be a custom embroidered baby blanket, well, that’s icing on the cake. At the Minky Moon, we put love, care, and attention to detail into every custom embroidered baby blanket we make. Having the perfect baby blanket is so important, and it’s definitely not something you can just go out and buy at the store – especially if you want handmade craftsmanship and custom embroidery. We all know that babies love their blankies, but we forget that parents get just as much joy out of choosing and giving those blankies to their little angel. Seeing your baby’s name beautifully stitched on something that they will tote around everywhere and that will make them feel safe when you aren’t there provides a simple joy. Our custom embroidered baby blankets are perfect to use from birth until forever. You can swaddle your baby in complete comfort as soon as you bring them home from the hospital. The plush Minky fabric that we use is softer than any other baby blanket material you can find, which is what makes it so great for swaddling, snuggling, and rubbing between those teeny tiny baby fingers. 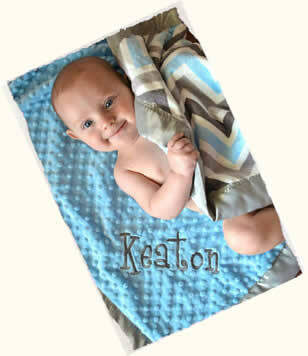 When you give your baby a personalized baby blanket, make that a personalized Minky baby blanket, you are essentially personalizing their comfort and sense of security, as well as helping them form strong attachments early in life. How can you beat that feeling? With the holiday season upon us, there’s no better time to get started building your own custom embroidered baby blanket. Not only do they make the perfect gift, but they’re also really fun and super simple to design. You choose the type, style, and color of fabric for each side of the blanket; choose your desired trim, if any; and then pick the font type and thread color for your personalized message or text. You can see all the changes you make to the blanket as you make them, and you can play around with it as much as you want until you’ve found the perfect combination. What are you waiting for? Design your own custom embroidered baby blanket right here. This entry was posted in Customized Baby Blankets on November 24, 2015.